Reykjavik excursions: gateway to adventure and discovery up to -70% off To take advantage of these offers, join now for free! Enjoy luxury holidays to Reykjavik with Voyage Privé and discover adventure and the wonders of nature; book online today. 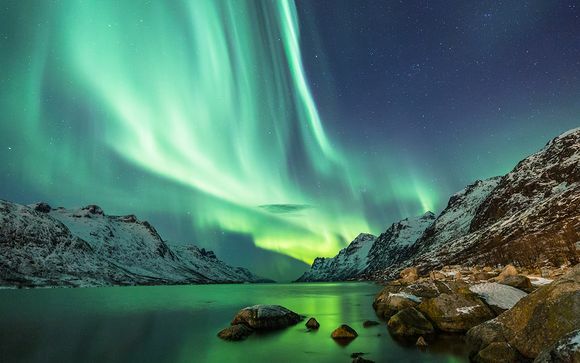 The Northern Lights tour in Reykjavik takes visitors on a magical journey to see this spectacular natural phenomenon that occurs during the winter months. Also known as aurora borealis, the spectacular display is caused by the interaction of the sun with the upper atmosphere around the North Pole. Beautiful variations in colour appear as different types of gas particles collide. Another popular activity is participating in a whale-watching tour, operated from Reykjavik's old harbour. Feel at one with nature while viewing minke and humpback whales, porpoises and dolphins in their natural habitat. 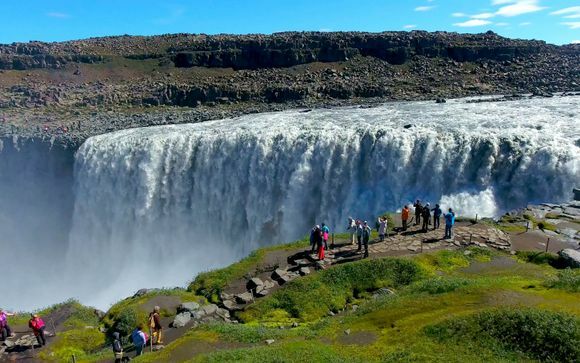 Enjoy the exhilarating Gullfoss, Geysir and Þingvellir tour, taking in geysers, waterfalls and the Thingvellir national park. Marvel at spouting springs in the Geysir geothermal area, home to Strokkur, Iceland's most active geyser. Stand next to the amazing Gullfoss waterfall, one of the wonders of nature and feel mesmerised by the vast quantities of water gushing into the deep gorge below. 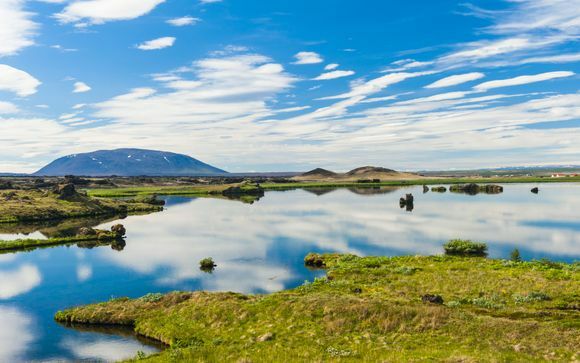 View the rich geological phenomena at historic Thingvellir national park, a key location in Icelandic culture, as it hosted the first known parliament in the world in 930 AD. Visit the famous Blue Lagoon spa, a popular destination for visitors. Located between Keflavik Airport and Reykjavik, the natural spa enables visitors to breathe in the pure, fresh air, while bathing in the warm seawater in the most beautiful location imaginable. Reykjavik excursions to see areas of natural beauty and wildlife are complemented by the Icelandic capital's vibrant atmosphere. Plentiful attractions ensure visitors can enjoy a complete holiday experience. Visit the Reykjavík 871 art exhibition and museum and then enjoy fine cuisine at the futuristic, revolving Perlan restaurant and cocktail bar, set in a glass dome within a park. Learn about local history at the Árbæjarsafn open-air museum, or enjoy an evening at the modern Harpa concert hall. When looking for high-quality accommodation in Reykjavik, choose from many luxury hotels, where your every need will be met. The hotels chosen by Voyage Privé are exclusively 4 and 5 star, such as the luxurious 4 star Hôtel Reykjavik Centrum. Reykjavik is enjoying a tourist boom and, as a result, many hotels are upgrading facilities and adding extra rooms to accommodate the growing number of discerning visitors. Experience the local cuisine, with locally-caught, fresh fish a popular dish, along with smoked lamb (hangikjöt) and the traditional buffet of Þorramatur, containing a selection of traditional meat and fish dishes. The local nightlife is vibrant, praised by travel magazines worldwide for its variety, with no entry fees and no queues at the friendly selection of bars. There are few nightclubs. Instead, you'll find welcoming cafés that transform into bars in the evening, with dancing welcome as the night goes on. 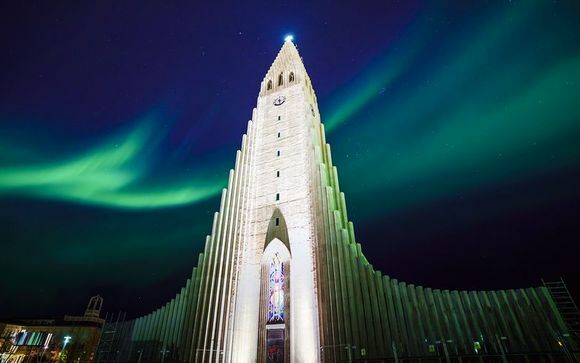 Your luxury holiday to Reykjavik can be filled with enjoying the city's natural beauty, sampling fine cuisine and basking under the breath-taking splendour of the Northern Lights spectacle. The atmosphere and spirit of Reykjavik is like no other. If you're looking for handpicked Reykjavik excursions, sign up today and see our exceptional discounts.